The buildings are surrounded by pine trees in a place of great beauty. They are located at 100m. of the town, which is very small, approximately 100 inhabitants, who multiply on vacation, however it has a supermarket and bar. The pharmacy and the medical center are 10km away. We have a heated pool and paddle court included in the price, the jacuzzi will be hired once in the accommodation for not being included, there is a barbecue with porch and table. A garden with benches where games and a pond can be played. We also have Catering service by an external company called La Venta de los Montes. Located in the heart of the natural monument "rodenal del Cabriel", our establishments enjoy a privileged situation where the whole environment is virgin, for being little known. The rural accommodation consists of two buildings, one of two floors, which is divided into four totally independent, and equal, rural houses, each with its entrance door. The names of these homes are: blue, red, yellow and green. The other building are two terraced houses. On the ground floor there is the dining room, the kitchen, the laundry room, a room and a bathroom adapted for the disabled, on the first floor four bedrooms and another bathroom. The equipment of the house is the same as the others. It is only two and a half hours from Madrid, one hour and a half from Valencia and one hour from Cuenca and Teruel. the traveler can enjoy landscapes of great beauty. Es realmente un alojamiento rural de lujo. Habitaciones muy amplias, camas grandes, buena limpieza, la calefacción funciona de lujo, la barbacoa cubierta (limpia, parrillas nuevas y tenía hasta horno), pantalla de tv plana y enorme con pincho para meterle películas a los críos. No tiene wifi, pero yo no voy a una casa rural para eso. Tiene una pista de padel con cristal en los fondos, con iluminación y cesped artificial. La piscina es un AUTENTICO LUJO, sinceramente, cuando lo leí en la página, dudé, pero está realmente espectacular, de temperatura perfecta tanto fuera como dentro, muy limpia, no es de cloro, es de sal. El trato que hemos recibido de los dueños del establecimiento es realmente cercano y amable ofreciéndose para lo que necesitáramos. 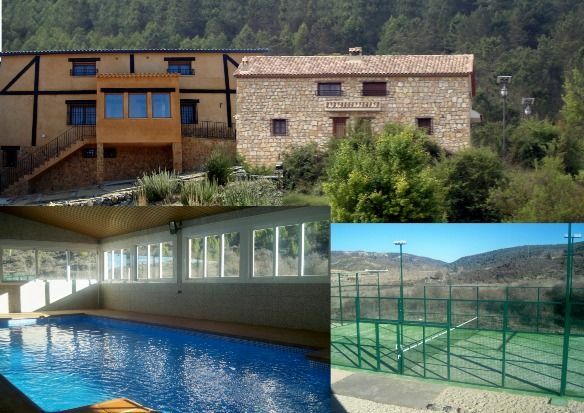 El señor que nos enseñó la casa incluso se nos ofreció a llevarnos a los sitios más bonitos de la zona, que es muy tranquila (particularmente estoy cansado de sitios excesivamente turísticos) y tiene unas formaciones rocosas espectaculares y un tremendo pinar. He estado en muchas casas rurales pero esta es, sin duda, la mejor en la que he estado. Sobre todo la recomendaría para invierno, aunque no he estado en verano, pero esa piscina cubierta rodeados de nieve no tiene precio. Acabamos de ir el pasado fin de semana 4 familias con niños. Todo estupendo tanto en el trato como en las intalaciones ( salvando las toallas de los baños, que estaban francamente "tiesas". The buildings are surrounded by pine trees in a place of great beauty. They are located at 100 m. of the town, which is very small, approximately 100 inhabitants, which multiply on vacation, however it has a supermarket and bar. The pharmacy and the medical center are 10 km away. Located in the heart of the natural monument "rodenal del Cabriel", our establishments enjoy a privileged situation where the whole environment is virgin, because it is little known. Ground floor is the living room, kitchen, laundry room, a room and a bathroom adapted to disabled. First floor four rooms and another bathroom. It is just two and a half hours from Madrid, one hour and a half from Valencia and one hour from Cuenca and Teruel. The traveler can enjoy landscapes of great beauty. The itineraries that can be done within Boniches are many: pine of the four claws, traqueiro, obrada, castil del rey, tabarreña, peña de los boumos, Chorreiro, the peaks. We have a homologated route of hiking of small route called CU 66, but there are many paths to walk without hurry, with beautiful landscapes throughout the year, in the autumn the mushroom picking with lots of them, and in the summer to bathe in the river Cabriel one of the best preserved in Europe. In our establishment we will provide information to make these tours. • Basin; World Heritage City. • The lagoons of the hole gully. • Pajaroncillo; where Celtic tumuli are found, an interesting archaeological site from the iron age, in an impressive mountain landscape. • Cañete; medieval village, castle, gates and walls. • Villar del humo; with his cave paintings. Moya El Castillo, at the top of the hill, is currently in the process of restoration and encloses a keep and retains part of the guard wall. the remains of six other churches. Also some doors of the 7 that in their day kept the Villa and the strength, as they are the door of the Villa, the door of the Eyes or the door of San Juan, among others are conserved. A double wall surrounds the top. • Monastery of the Virgin of Tejeda, in garaballa. • Valdemeca with its sculptures on traditions in rural areas. • Albarracín; and its old town. • Teruel; with its lovers and Mudejar monuments.